The coming of the war in 1939 came (as it did in 1914) presumably as a shock to our band as they were still preparing for a contest right up to the outbreak. Eric Barrett said they had “wasted their time”. In reality our band did close down this time round with more or less all of the men going off but some modicom of effort to keep things ticking over was still made. Ralph Bridgman, a very talented cornet player from Ware in Hertfordshire had been asked by Dimmock to come to play with us as our principle cornet player. Ralph had been encouraged here by various bandsmen and supporters who had even helped him eke out a living and Oliver Hawkins allowed him use of some land on which he kept chickens. Being a contentious objector Ralph had not gone to war but had decided to get some of the boys of the village together. We can see them all in a photo taken in the garden of Beech Knoll House, they are: Sidney Barrett, Dennis Keen, Harold Wilkins and David Smith. On cessation it was not long before we were back in action. Eric Barrett soon started to contact players as they in turn came home. On May 17 a meeting re revival was organised, Bill Deacon presiding. Oliver Hawkins told that the finances stood at £I5-00. 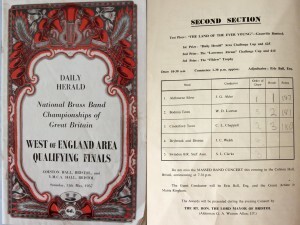 The new committee consisted of Jim Barnes hon sec, Bill Deacon chairman and Edgar Dixon, C Barrett, F Smith H Wilkins and Wilf Jerram as bandmaster, and so they were off once again with winning ways in the junior section of the Reading contest. Dimmock never returned. He had once told the band that he would ask Dr Dennis Wright, a then leading brass band officiate, to come but this never was to be, if the war had not occurred who knows what the future may have held for them. I leave off at this point for the period following the second war is not for me to touch too heavily upon and I feel I must leave something for the future. I must however not exit without a some mention of highlights of events that followed on after the regrouping in 1947. Events now took on a positive turn with the band becoming more and more successful on and off the contest stage. The professional conductors that came after the war were from 1953 to 1956 a Mr William Scholles of Rushden Temperance and from 1958 to ? a Mr George Crossland of the Marston Valley Band. The successful times continued though arguably the best band was yet to come under the wing of Don Keen. The era of Bob Barnes was as good a time as ever for winning ways. The band became a Championship section band in 1963 though Bob once said that “now the band was in the top section we were not able to win quite so often as the competition was much stiffer”. Born not in Aldbourne but London. His parents had come from the village so a dabchick he may not have been in the true sense of the word but a Dabchick he was by blood never the less. He demanded nothing short of perfection and when he couldn’t get it would go off else where in search for it (not finding it meant returning to us for another go) Although he switched between the G.W.R band of Swindon a few times he always did return. Joseph jnr was a very advanced man in his thinking for his time. By this I mean he was a very able player who had an inner need to be as professional as possible. Even his posture in the early band photos show him posing for the photographer. Joe`s stance to banding is to be likened to the attitude of players from more Northerly climates. I am sure that if he had been a Yorkshireman he would have been even more feared than he was, and believe me he was a feared man, making many of his students cry when giving them lessons! Fred , his brother was not afraid of him and several times at band rehearsals they nearly came to blows. Once when rehearsing in West Street Joe asked Fred to play in a certain style but Fred refused and Joe almost threw Fred down the stairs during the row that followed. The fellowship of banding sometimes runs a little off course! Reg Penny, a non-player member of the band from 1918 to 1928 tells of seeing a young William Braxton with swollen lips and eyes after a lesson with Joe, meaning that he had not only been working hard but that he had been crying as well due to Joe`s hard ways. Joe`s need for the band to progress, come what may, resulted in the retirement of some of the older players such as Harry Westal when Joe took over as Band Master. He wanted the band to advance and improve but his ways could be far from subtle. Rolly Mundy, a Swindon man that also played with us, tells in a letter that “Joe could be very temperamental and quite severe in his methods but he got good results”. Joe was probably the toughest man the band has ever known. After Cyril Winstone, a Salvationist from Swindon joined the band on principle cornet Joe came back and played the repiano part. Joe conducted the band on and off between 1922 1929? and 1956? When in his late years the band would arrive during xmas week to play him a couple of carols. Don Keen would always tell us to play as well as possible or Joe would be criticising us. He died in 1973 at the age of 77 of T.B and the band played of course at his funeral. Wilf had been the solo baritone in the band for many years and a very good player he was too. An amusing little tale is the time he played the missing note of the chapel organ on his baritone. He played the missing note every time it appeared through out the service, honestly. Wilf took the band after the second war until the early fifties. Under Bobs direction came the man who was to make the Aldbourne Band of the late seventies and most of the eighties probably the best trained unit the village has ever had. A few might dispute this but the players of this time were without doubt, technically the most proficient and when under Don Keens direction had several noticable successes, a hat trick win at Reading and the West of England title in 1981. After Don’s departure in 198? the band entered a period of great unrest. As you now know it’s life has been one of several stops and starts and when in 1994 it nearly came to yet another breach in its life. Some were ready to admitted defeat and if it was not for the one thing that this village is renowned for, fortitude and fighting abilities, it would have succumbed. Fortunately we resisted, and with the high moral that our present band members are deemed rich with we are once more becoming a “Worry to the others”. I stop at this point with my ramblings and I leave any in depth work of the period of post world war two in the hands of another. My advice to that person is to not leave it as late as I nearly did. I missed out on much of the knowledge of Eric Barrett, Bob Barnes, Big Arthur Palmer, William Braxton, and of course every one else who has passed away before I started to ask questions. I only just caught Arthur Palmer, Mrs Molly Lunn, Bill Deacon and Reg Alder before they died and it saddens me to think what stories I’ve missed out on just because I and few others never thought to ask our older members any questions.